Maruha Motors sports metal catalyzers MAZDA - MiataRoadster - Stay tuned with MiataRoadster! Imagine, a new muffler and exhaust manifold have already been set in order to upgrade your MIATA. Is your work done? 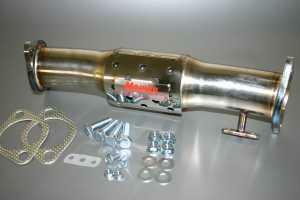 Make sure that the key to gaining more torque and engine power is installing Maruha’s catalytic converter in your car. What do you need for your ideal sports driving? Your list may be long but the three words “get more power” will be attested in the list. Our catalytic converter features not only its function of reducing exhaust gas emissions but also the simple & stylish design as well as it provides the high exhaust efficiency to powerful driving. Car catalysts are generally divided into ceramics and metal ones. Maruha’s product, whose metal materials can withstand the heat of above 1000 degree Celsius, maintains its stable performance under severe conditions. Furthermore, the catalyst honeycomb increases exhaust efficiency with no hindering the fumes flow. The metal honeycomb wall is thin, but has enough strength. 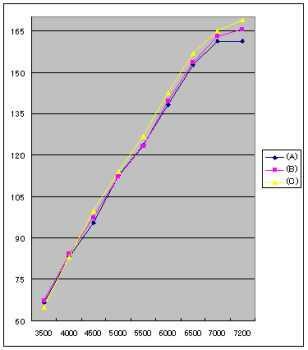 The thin thickness can provide a catalyst with good heat conduction to perform the function well. It cannot be operated in cold engines, but otherwise the thin honeycomb wall that can immediately heat up makes the heat conduction more improved in order to clean up effectively the exhaust (CO, HC, NOx) from cars through the catalyst. Besides their enough heat resistance to withstand the high temperature emissions they are always exposed to, metal catalysts are also required high anti-corrosion ability and vibration resistance because catalyst converters are installed in engine systems which vibrates incessantly. Maruha sports metal catalyzer also features the design with the streamline shape that allows the catalyst performance to be increased. Popularly, one is simply connected its catalyst body and pipelines, that is, the structure tends to decrease the catalyst performance by accumulating the exhaust gas on the corners of the catalyzer inside. We have solved the problem by means of streamlining our converter with slight curb to promote the exhaust efficiency. Flanges are required in order to connect Maruha’s converter to other emission systems. Our flange is designed to meet the allowances of the genuine Miata gaskets in common with NA6 and NA8 models, besides the precise connection between the flanges and the 60 mm pipe can prevent gas leaking, increasing the exhaust efficiency. 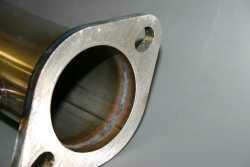 Moreover, the pipe whose outside diameter is 60 mm helps Naturally Aspirated (NA) type Miata to gain its power. Then, how much power do you expect to have in installing Maruha sports metal catalyzer in a car? • Using fuel for race cars, we do not handle complaints about all damages caused by natural deterioration including the catalyst melt and the crack failure of the body.